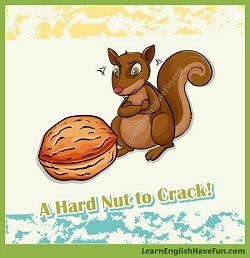 These N idioms will help you “take NOTE of” common idioms beginning with the letter “N.” “In a NUTSHELL,” you need to master idioms to reach a high English level. Before we get started, you hopefully remember what an idiom is, right? An idiom is a group of words that has a meaning that is different from the individual words that make up the expression. 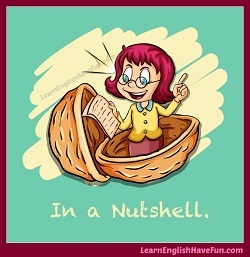 If you looked up the words "in" "a" and "nutshell," you would think it means something inside the shell of a nut. It actually means, "in summary." So, idioms have to be understood and then memorized. They are not unique to English and I am sure you managed to learn many idioms in your first language. So relax, and remember you don't have to use them a lot when you speak English—it's most important that you understand them. 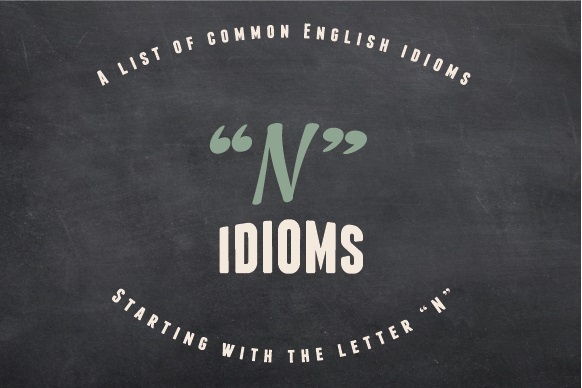 This list has expressions beginning with the letter "N"—that is, the main word in the idiom starts with this letter." I've also created pages of expressions with other letters of the alphabet: click here to go to the main idioms page. hit the nail on the head: to do or say something exactly right. You hit the nail on the head with your proposal at the staff meeting yesterday. Your comments about the lack of funding for after-school programs really hit the nail on the head. nail something down (nail down something): to determine or fix something. We’ve got to nail down the dates for our vacation and start making hotel and airline reservations this weekend. I was able to nail down an interview with the governor for Friday afternoon. (a) nail in someone / something’s coffin: to help bring the end or death of something more quickly. My latest injury put another nail in the coffin of my collegiate football career. If I get another poor grade in math it could be the final nail in my coffin. tough as nails (hard as nails): very strong, determined, persistent. She may be the smallest pup but she’s as tough as nails. The other team was tough as nails and we were intimidated by them from the very beginning. clear one’s name: to prove innocence about something (that you did not do something wrong or illegal). Even though they jury found him innocent and cleared his name, many people still believe he’s guilty. The politician vowed that the investigation would clear his name of any wrongdoing. give something a bad name: to cause something to not be respected anymore. It’s a few egocentric, bigoted and intolerant Americans that give the rest of us a bad name around the world. A few attacks by aggressive pitbull dogs give the rest of the breed a bad name. in name only: have a title but not the power or duties required for the role. Our boss is the director in name only — it’s really my colleague who's running the department. Even though this car is in my dad’s name, I’m the one who drives it and pays for insurance and maintenance. in someone’s name: representing someone (often in honor of someone). After my father died, I created a scholarship in my parents name at the university where they met. I would like to open a bank account in my daughter’s name and have custody over the account. make a name for oneself: to become famous and known for doing something important or well. One day I am going to make a name for myself by finding a cure for cancer. My grandfather made a name for himself growing the most beautiful orchids and roses and giving them to patients in hospitals and nursing homes. one’s name in lights: to be famous for some important work (in reference to the brightly lit marquees in front of theaters that have the names of the actors in a performance). Every actor's dream is to see his name in lights on Broadway. I know you don't believe me but you're so talented I know that one day I'm going to see your name in lights. the name of the game: the most important thing or activity. In language learning, actually using the language by speaking is the name of the game. At this firm, getting assigned to the biggest cases is the name of the game. drop names: to mention one’s connection to someone famous or influential to try to make oneself also feel important. Her father is an accountant for several pop stars so she always drops names but she’s never actually met any of these singers. I don’t mean to drop names but my uncle is Brad Pitt’s mother’s next-door neighbor so maybe he could help you get in contact with Angelina Jolie. call someone names: to describe someone with rude or insulting words. It’s really childish to call your wife names when you disagree, and it’s going to harm your relationship over time. name names: to say the exact name of the person who is doing something wrong. I don’t know who was smoking in the house this afternoon while I was out but if someone doesn’t name names soon you’re all going to be punished. I didn’t steal that girl’s purse but I know who I did. Sadly, the person is a bully and if I name names it would be much worse than the punishment I’m currently receiving. near and dear to someone: something that is very special to someone. It may not look important but this dirty old stuffed bear is very near and dear to me. When you get older you’ll learn that it’s your family and a few good friends—not your 500 Facebook acquaintances—that will be near and dear to you. break one’s neck: to make a huge effort, to try very hard. Our director broke her neck finishing the report over the weekend. I break my neck trying to keep this house clean and you come home and make a mess every day. breathe down one’s neck: to pressure someone by watching them closely. I cannot fix your phone with you breathing down my neck like this. Please come back in 30 minutes. If you don’t finish your homework early, I will breathe down your neck all evening long until it is done. neck and neck: at the same position or equal. The horses are neck and neck as they come around the last turn to the finish line. We’re still neck and neck after playing this video game for the past four hours but we’re going to keep going until someone wins. one’s neck of the woods: an area or location where you live. I’ll be our near your neck of the woods on Friday so I was thinking I’d stop by and say hello. The next time you’re going to your mother’s neck of the woods can you please give this casserole dish back to her? My boss is such a pain in the neck. He makes me stay late waiting for him to finish his work because he's afraid of being alone at the office after hours. I'm glad we're best friends now and I'm sorry I was a pain in the neck when we were little. risk one’s neck: to do something risky or dangerous. Please get down from that chair and get a ladder—you’re risking your neck trying to hang the lights that way. When you drive drunk you’re not only risking your own neck but you also could hurt someone else. stick one’s neck out: to take a risk. We can wait until tomorrow to return this, I’d rather pay a late fee than stick my neck out driving in this snow. Thank you for sticking your neck out and bringing this to me—I hope no one saw you take it. up to one’s neck in something: to be very busy doing something. I’m up to my neck in laundry and ironing this weekend. You’re always up to your neck in work—why don’t you hire someone to help you? if need be: if necessary. Just invite everyone. We can take two cars to the restaurant if need be. I hope the repairs won’t cost too much but I’ll put the charges on my credit card if need be. (something) is all one needs: something that you do not want or need at all. Oh, great a parking ticket. All I need is another bill! Please tell her I’m in a meeting for the next few hours—all I need is to listen to my mother complain about something stupid. 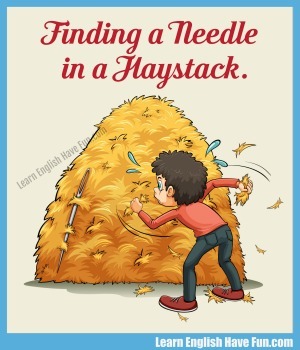 a needle in a haystack: something that is very difficult to find. I looked everywhere for my earring at the beach but it was like trying to find a needle in a haystack. We've been looking for an apartment in Geneva for six weeks and it's like finding a needle in a haystack. (somewhere) in the neighborhood of something: approximately. He must be doing very well. I heard the salary for a partner in his firm is in the neighborhood of $450,000 and that's not including the annual bonus. The drive to New York will take somewhere in the neighborhood of five hours if there’s no traffic. get on one’s nerves: to annoy or bother someone. When our neighbor talks on the phone for hours it really gets on my nerves because we can hear everything he says. That song gets on my nerves—can you change the radio station? lose one’s nerve: to be afraid of doing something; to lose the courage to do something. I was going to ask Sarah to dance but I lost my nerve and now some other guy is talking to her. I signed-up for the competition the first day because I was afraid I’d lose my nerve and never practice if I didn’t have a serious reason to do it. touch a (raw) nerve: something that is especially irritating or annoying to someone. Please don’t mention Sarah’s name tonight—you know that touches a raw nerve for Steve. Anytime they talk about how all poor people are lazy and don’t want to work it really touches a nerve with me. break the news: to inform someone of something bad that has happened. I hate to be the one to break the news but I heard they gave the position you wanted to a guy from the marketing department. When I broke the news that I was moving to Japan, my wife cried for hours and said she wasn’t coming with me. (that’s) news to someone: this is the first time the person has heard this information. It was news to me that my parents had divorced when I was five and remarried two years later. Uh-oh, the next few days will be difficult. I have next to nothing in my bank account and don’t get paid for another week. The traffic was so bad it took us next to two hours to drive three miles. next to nothing: almost nothing, very little. Before my grandmother died, she weighed next to nothing and they had to feed her with a tube. You won’t believe this but this purse cost me next to nothing — it was on sale for 60% off. (just) in the nick of time: before the very last moment or deadline. You got here just in the nick of time, the movie’s about to start. I stayed up all night but I managed to finish my term paper in the nick of time. night and day (day and night): all the time. You’re on Facebook night and day, why don’t you take a break? Our neighbors play loud music night and day and just laugh at us when we ask them to turn it down a little. I’ve been working day and night to try to complete the project by the deadline but I still think I’ll need two more weeks to finish it. get the nod: to get approval for something. Yes! I got the nod from my parents to get my ears pierced. Let’s hope we get the nod on this project’s funding within the next two weeks so we can get started. nod off: to fall asleep. Pull over and let me drive — you look like you’re about to nod off. My husband comes home, eats dinner and nods off in front of the television every evening and that’s it. a nose for something: have a talent or ability for finding something. You have a real nose for finding bargains whenever we go shopping. I don’t know, my mother has a nose for finding out when I skip class and she won’t hesitate to tell your mother if we’re absent. follow one’s nose: to follow one’s intuition or move forward. I don’t have directions but I’ve been to this place before and usually I can just follow my nose. When my girlfriend followed her nose and looked in my backpack, she discovered a love note her sister wrote to me. keep one’s nose clean: to not get into trouble. Try to keep your nose clean tonight when you go out. When I was younger I always wanted to fight, but I’ve kept my nose clean since I started college. keep one’s nose out of something: to not get involved in something. I wasn’t talking to you — just keep your nose out of this. I wish my mother-in-law would keep her nose out of our marriage but she always tries to talk about really personal things with my husband. keep one’s nose to the grindstone: to work very hard without taking a break or being distracted. I promise I’ll spend more time with you after tax season is over but for now I’ve got to keep my nose to the grindstone. This is the first semester that I don’t have to keep my nose to the grindstone since I only had term papers to write and I finished them early. look down one’s nose at someone / something: to see something or someone as inferior. I hate to say this but my father looks down on anyone who doesn’t come from a wealthy background. Don’t look down on these jeans just because they don’t have a designer label on them. If you like them, buy them. nose around: to try to find information about something. Try to nose around and find out what your brother would like to do for his birthday. There’s something very serious going on at the office and everyone’s trying to nose around to find out if there will be layoffs. powder one’s nose: to go use the toilet (an expression used by women). Excuse me sir, I need to powder my nose. Could you tell me where the restroom is? We’ll be back. We’ve got to powder our noses. stick / poke one’s nose into something: to intentionally try to find information or get involved in something that is private. Just because were married doesn’t give you the right to stick your nose into my business and read my private emails. I’ve asked to be moved to a new department. I can’t say anything without my colleague trying to poke his nose into every conversation I have and I’m tired of it. turn one’s nose up at something: to not like something because you think it’s not good enough for you. You always turn your nose up to different ethnic foods but you have no idea what you’re missing. Before you turn your nose up at volunteering, read about how it changed these people’s lives. under one’s nose: to be very close but not noticed. I was looking for my keys all morning but they were right under my nose the whole time. Many times the solution to our problems is right under our noses. not oneself: to not feel the way one normally feels; to feel strange. Since I started to take this medication I haven’t been myself, so I may have to stop using it. My sister hasn’t been herself since her last child went to college this fall. a notch above / below (someone / something): something is slightly superior or inferior to someone / something else. I really love the cover of this song but it’s still a notch below the original. Both of my children are great at swimming but my youngest is a notch above my oldest. make a mental note: to make an effort to remember something you don’t write down on paper. You might want to make a mental note for the future that we also offer free delivery. I made a mental note to pick up my dry cleaning on my way home tonight. take note of (someone / something): to pay attention or give attention to something. Please take note of the requirements for completing this course — they're listed right here on the syllabus. If you’re traveling to the beach this weekend, take note of the construction on I-95 and plan your travel accordingly. compare notes: to exchange information and opinions about something. We should get together and compare notes about babysitters, parks, child-friendly restaurants and stuff like that. Last night I compared notes with my coworker and discovered she makes a lot more money than me. Oh, it was nothing much. I’m always happy to help. There’s nothing much left to do so just sit down and relax until dinner is ready. there’s nothing to it: it’s easy to do. Don’t worry about taking the bus to New York, there’s really nothing to it except showing up on time for departure. You’re going to love yoga — there’s nothing to it. at a moment’s notice: almost immediately. My husband works for the military so it’s common for him to get deployed at a moment’s notice. Do you have your ticket ready? I want to be ready to board the train at a moment’s notice so we can get a good seat. (on / with) short notice: with a brief amount of warning. I told my boss that I was really sorry but I wouldn’t be able to work this weekend on such short notice. You can’t expect me to always be able to help you with short notice like this. Luckily, although it was short notice, I got the message in time to get here. (every) now and again: once in a while; sometimes. Every now and again I see my ex-boyfriend at the gym and I still feel really nervous. Now and again you should stop by and say hello, we miss seeing you. (every) now and then: once in a while; sometimes. Every now and then, Apple offers discounts but normally their prices are set and don’t change. Now and then I like to have a nice glass of wine but usually I don’t drink alcohol. (it’s) now or never: something needs to be done or the opportunity may never happen again. Next year were going to try to start a family so I feel it’s now or never to backpack through South America. Don’t ever say it’s now or never about traveling overseas. You can always take your children with you! I've almost finished the problem set but this last equation is a hard nut to crack—can you take a look and try to help me? Getting into Harvard isn't impossible but it's a hard nut to crack. Your sister is a hard nut to crack. Sometimes she's really nice and other times she's really quiet so I don't know if she likes me or thinks I'm an idiot. In a nutshell, it was the worst trip of my life but I’m not going to torture you with all the boring details. In a nutshell, it will cost about $15,000 and take three months to complete the repairs. The proposal includes the full information about the work we would do. Have you signed-up for my free newsletter? I include an audio magazine article every month that's filled with new vocabulary and idioms. You can also find many idiom definitions with on of the online learner's dictionaries. I always recommend to my students that they first focus on understanding. Idioms can be difficult to use and your English will be perfectly fine if you don't use a lot of idioms. But you do need to understand them. The best way to check that you truly understand an idiom is to be able to use them in your own sentences. Writing your own sentences will also help you remember them better. I will revise any mistakes in your practice sentences. So that's why you've got the opportunity here to practice. Simply choose one or several N idioms from the list and create your own sentences in the comments box below.